Jason Jay Stevens, and Anne Wallace. 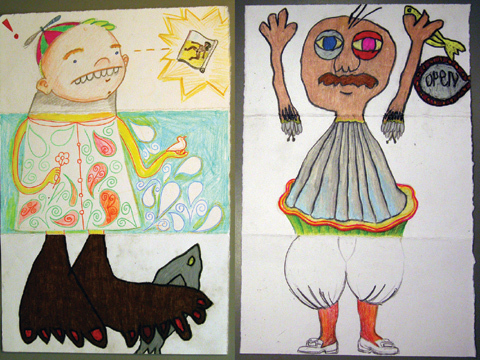 20th Century Dada drawing game known as Exquisite Corpse. Sale of the more than 50 unique artworks will benefit the Artist Foundation of San Antonio. On exhibit at Gallery 118 located at 118 Broadway in San Antonio. and open on Saturday, December 1, noon to 8pm. Husband and wife artist duo, Leslie Raymond and Jason Jay Stevens, often invite guests to their home and studios to play a collaborative drawing game. The game was invented by a group of early-20th Century European artists known as the Dadaists, and given the absurd name Exquisite Corpse. During the game, participants take turns drawing different parts of a figure, without being allowed to see the parts others have drawn on different segments of the paper. The results are often bizarre and hilarious. For this show, Raymond and Stevens invited local professional artists to all-day banquets held at their downtown San Antonio home to make special Exquisite Corpses to be framed and exhibited at Gallery 118 on the 30th of November and 1st of December. Proceeds from the sale of the drawings will benefit the Artist Foundation of San Antonio, which annually provides awards to artists across disciplines with the express purpose of enriching the artistic and economic fabric of San Antonio. Check out previous Potter-Belmar exhibitions of Exquisite Corpse.